This item does not mask odors it removes them! This item can be used just about everywhere - Homes - Restaurants - Bars - Automobiles - Hotels - Warehouses - Commercial Buildings - Classrooms - Etc. Remove Pesky Smells - Pet Odors, Mold & Mildew Odor, Fire & Smoke Damage Smells, Paint Fumes, Air Pollution, Water Damage. Remove Allergens - Pollen, Mold, Mildew. Removes viruses and bacteria from the air. Smelly project - Keep in mind bad odors can become embedded into fabrics and walls of a space with prolonged exposures. Even after you use this ozone generator the bad smells will continue to emit from the walls and fabrics in your home until treated. 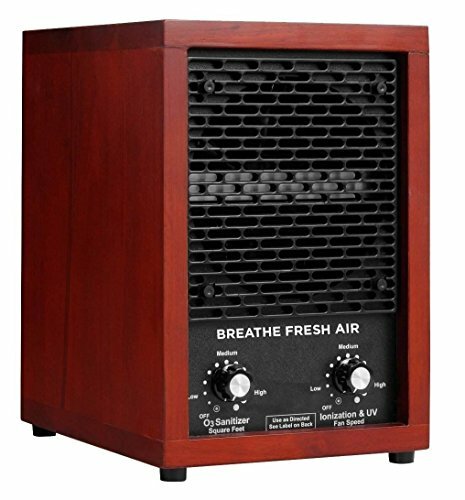 This unit can keep removing the bad smell from the air as it is emitted. Car Renewal - Combined with washing the fabrics of your car, the use of this unit you can help make an old car smell new again. Also helps remove cigarette odor from car. GENERATOR - Ozone generator intended for use in occupied spaces. Machine has a timer you can set and come back after ozone-deodorizing process is complete. Return 1-2 hours after turning off and your space will smell extremely fresh like the smell after a lighting storm. While on the unit smells like chlorine or bleach in high concentrations as the air is being scrubbed of bad odors - this is normal. After the ozone goes to a lower concentration it smells like after a lighting storm. Removable Ozone Plate - Comes with built in ozone plate with 5000 hour rating - removable for easy replacement. 30 Day Return Window - Not satisfied? We can accept a return for any reason, no questions asked. POWERFUL, YET COMPACT - Machine deodorizes and eliminates most every bad odor imaginable - Dust, Cigarette/Cigar Smoke, Pet Odors, Water Damage, Smoke/Fire Damage, Cooking Smells, Paint/Cleaning Solvents and Fumes, and other airborne irritants. Also kills Airborne Viruses/Bacteria/Germs and removes Allergens such as Pollen. This machine does not mask odors it removes them from your air! COST AND ECO-FRIENDLY DESIGN - Ultra-low energy usage yields cost and energy savings. Industrial grade steel casing will keep this purifier cleaning for years to come. USA 110V Y Model. OZONE GENERATOR - Ozone generator intended for use in unoccupied spaces. Machine has a timer you can set and come back after ozone-deodorizing process is complete. Return 1-2 hours after turning off and your space will smell extremely fresh like the smell after a lighting storm. While on the unit smells like chlorine or bleach in high concentrations as the air is being scrubbed of bad odors - this is normal. After the ozone goes to a lower concentration it smells like after a lighting storm. UV STERILIZER & HEPA FILTER INCLUDED- The UV sterilizer kills Cold and flu viruses. The Hepa filter catches larger allergens like pet dander. PLUG AND PLAY - Machine is ready to operate upon arrival - no assembly required. Ideal for spaces up to 3500 square feet. Low 50 Watt power consumption. Extra fuse included inside the plug on the machine for backup. 9" X 6" x 11.5" 30 day unconditional refund policy- 1 year warranty. CE Approval! If you have any questions about this product by Breathe Fresh Air, contact us by completing and submitting the form below. If you are looking for a specif part number, please include it with your message.